Product information "HI98121 pH/ORP/Temperature Combo Tester $179.00"
The HI98121 is a lightweight ergonomically designed tester. This tester is designed to float making it ideal for taking readings virtually anywhere. With the HI98121 it is possible to monitor both pH and ORP at the same time. The HI98121 is commonly used to monitor pH and chlorine for many applications including swimming, food sanitization, plating wastewater treatment, and cooling tower water treatment. By definition pH is the measurement of the voltage generated by an electrochemical cell at zero current. The potential generated is proportional to the thermodynamic activity of the ion being measured. 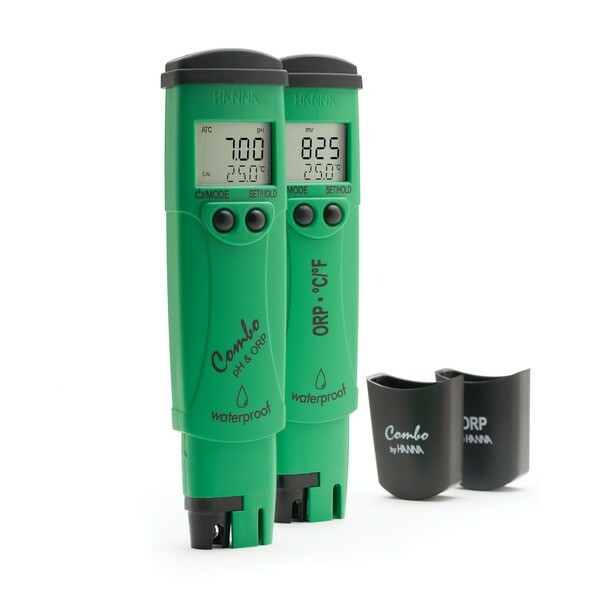 Similar to a pH measurement that quantifies the how acidic or alkaline solutions are, ORP (Oxidation Reduction Potential) measurements quantify the overall state of a solution as having the ability to oxidize or reduce a chemical species. Oxidizing and reducing reagents are used to participate in chemical reactions known as a redox reaction. An ORP sensor must be chemically inert; it cannot be oxidized or reduced itself. It must also have the proper surface characteristics to promote rapid electron exchange, a property known as high exchange current density. Two noble metals have proven to work well for this purpose: pure platinum and pure gold are both used in the construction of ORP sensors. Related links to "HI98121 pH/ORP/Temperature Combo Tester $179.00"
Customer evaluation for "HI98121 pH/ORP/Temperature Combo Tester $179.00"